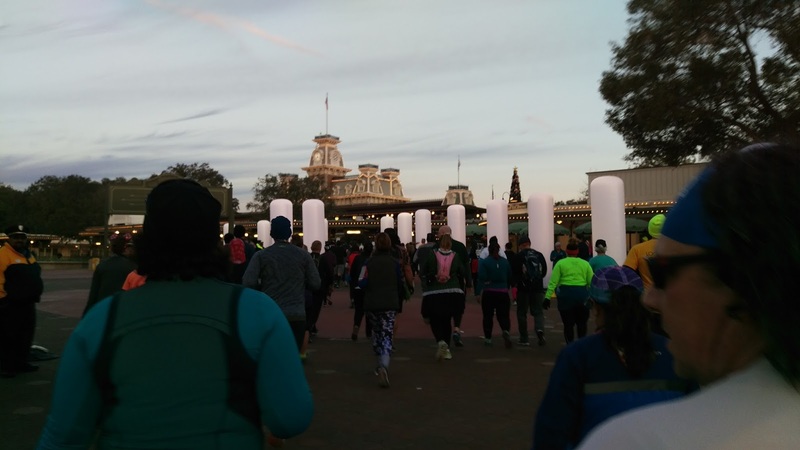 This recap will cover the WDW Half Marathon. Stay tuned for the recap of the WDW Marathon! Saturday morning brought another early wake-up (2:30 am) and another chilly Florida morning. 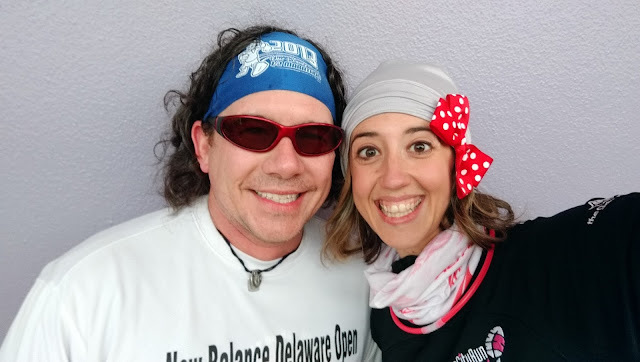 Matthew and I got dressed in the outfits we'd thrown together the night before- since it was going to be in the 40's with a real feel in the 30's during the entire race, we had to slightly adjust what we were going to wear to the race. Not pictured: tank top, pants, gloves, flipbelt, Altra buff, Mojo compression socks, and a couple of mylar blankets. I wore a running sweatshirt and the bathrobe to keep warm as we boarded a bus to the start line. 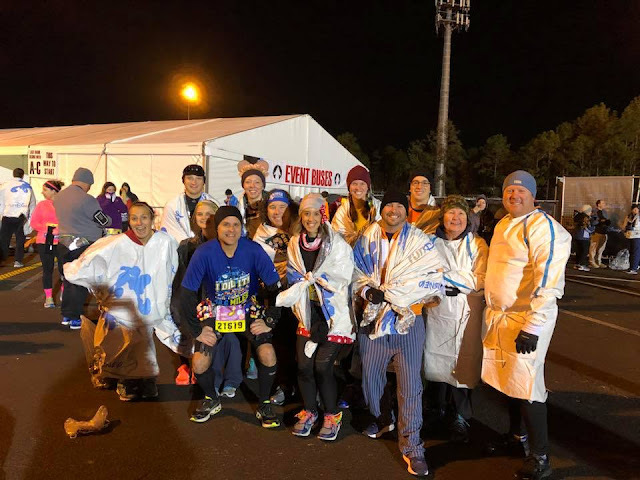 Once we arrived at the staring line area (the Epcot parking lot), we met up with our ohana and chatted about race strategy and got our traditional pre-race photo. How is Jeff wearing SHORTS?! 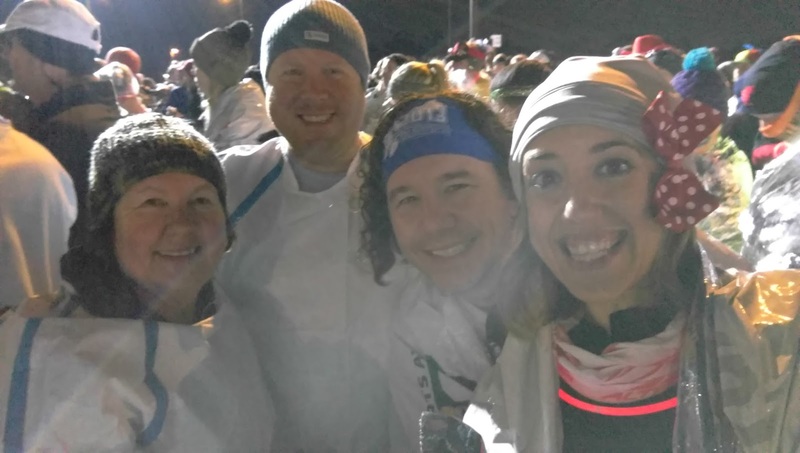 Around 5 am, we started our three-quarter mile walk back to the corrals. The race would start at 5:30 am and with us in corral F, we guessed that we would start somewhere between 6 and 6:30. Before we went back to the start, both Matthew and I dropped off our gear check bags and at the last minute, I decided to check the bathrobe so I could have it for the marathon the next day. I wrapped the mylar blankets around me, opened up my hand and body warmers, and hoped I'd be warm enough standing around in the corrals. On our way back to the start, we walked with Jim and his mom, Charlotte as they were starting in F as well. Jim was doing Dopey (he's a "perfect" by the way- meaning he's done all five Dopey Challenges!) and Charlotte was doing the half. 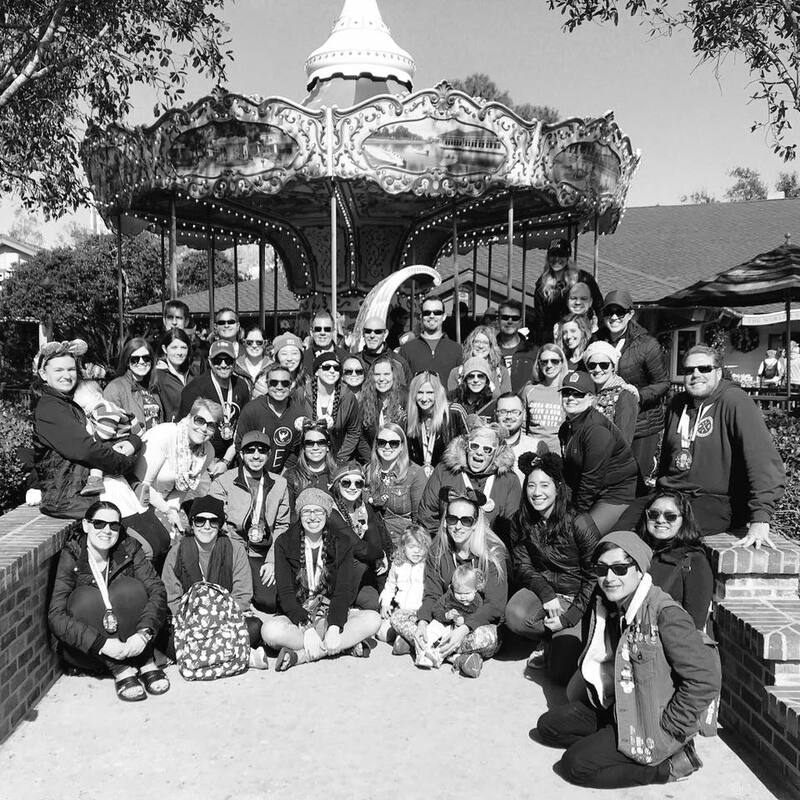 It was so nice to have friends to hang with in the corral! 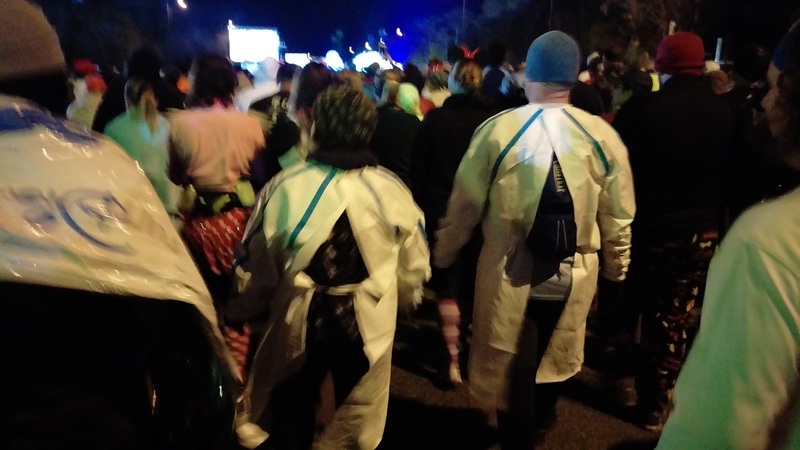 Jim works for a company that makes chemotherapy drugs so he and Charlotte had these awesome hazmat looking suits to keep warm while in the corrals. 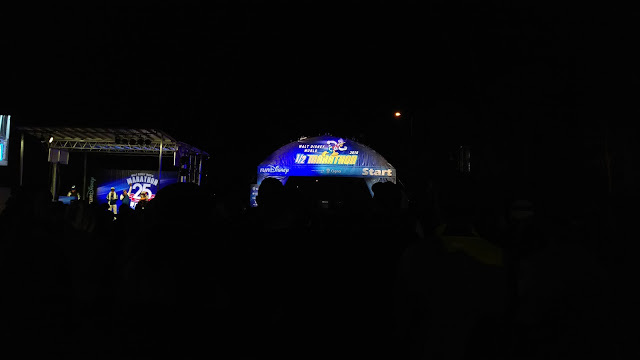 Before long, the race started with a burst of fireworks for the wheelchair participants- the first folks to start at every runDisney event. With the "mini-wave" system new for this year's races, we weren't sure how quickly we'd get to the front. There were 8 corrals (A-H) and within each corral, there were 3 "mini-waves" with about two minutes in between them. Surprisingly, we were up to the start line within about 25 minutes of the first wave. With the mini-waves, once the race started it felt like we were continually moving forward; not starting and stopping like it was before. 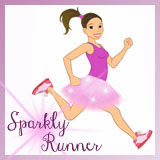 I really enjoyed this change and feel like runDisney got this one right. If you look closely, you can see Donald on stage to the left! In all seriousness, I like this course because I can break it up into two parts. For the first fiveish miles of the course, I just keep saying to myself- and sometimes to Matthew- "Let's just get to the castle." So that's what we did for the first part of this race. Since we started in F, all the character lines were outrageously long so we skipped all of them. We were disappointed that the DJ that's usually right near mile 4.5, right as you go under the water bridge by Seven Seas lagoon, wasn't there this year. 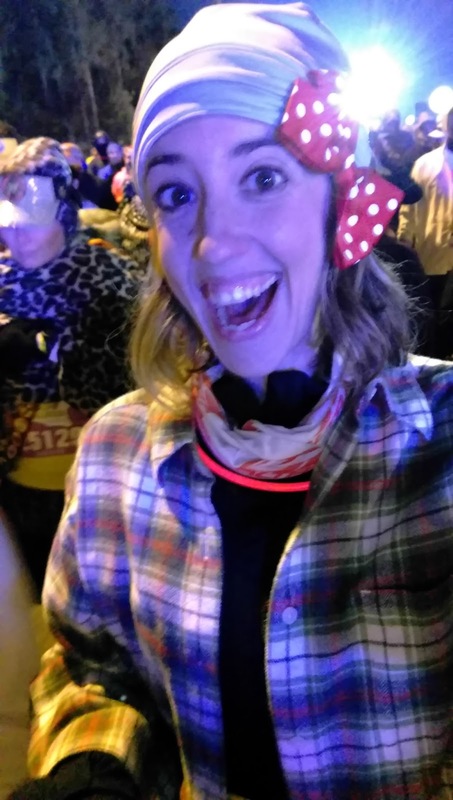 However, there were speakers playing the music from Haunted Mansion as we ran under the bridge and it was a little spooky with all the runners' shadows moving along the walls of the tunnel. Only three more miles until Cindy's castle! Matthew and I chugged along, probably at about 13-13:30 minute/mile pace (I don't know because I didn't even look at my watch the entire race), and slowly we rounded the corner by Space Mountain and started towards the side entrance of Magic Kingdom, like we've done several times while doing this race course. However, we didn't go into the side entrance, we ran right through the front gates! Matthew and I were so shocked at this change heading into the park- we've never entered this way before. 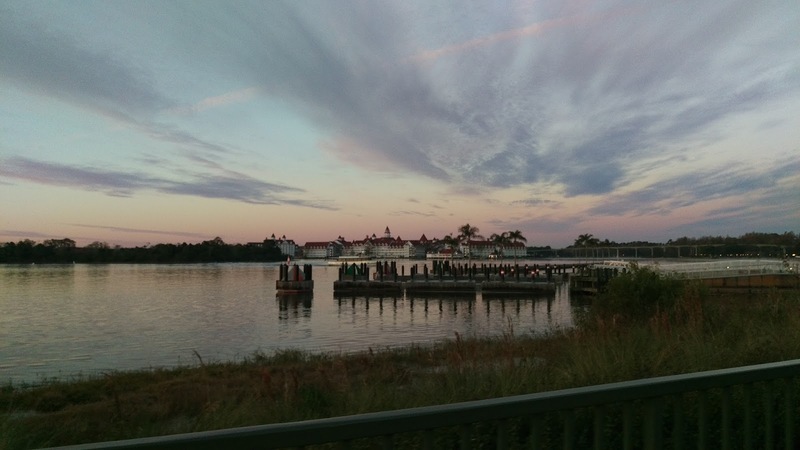 We were treated to a beautiful view of Grand Floridian before running through the "guest entrance" gates and into the park. So new! So different! So cool! Well, good morning, Magic Kingdom cast members! 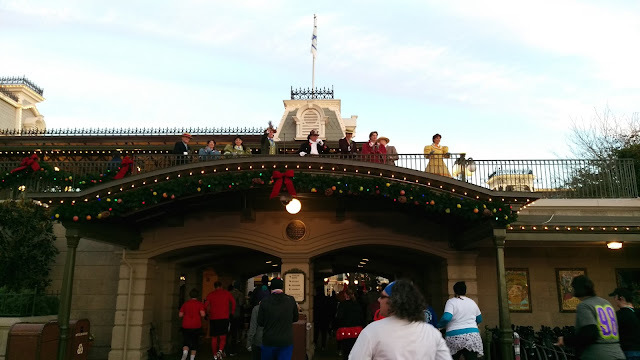 I really, really loved how we entered Magic Kingdom (MK) this year. 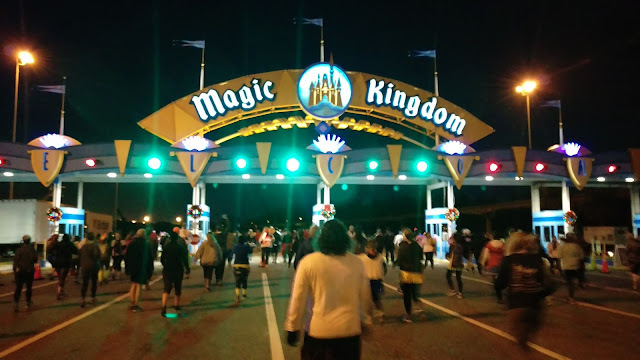 Another win for runDisney- this was a cool surprise for those of us who've run this race multiple times. 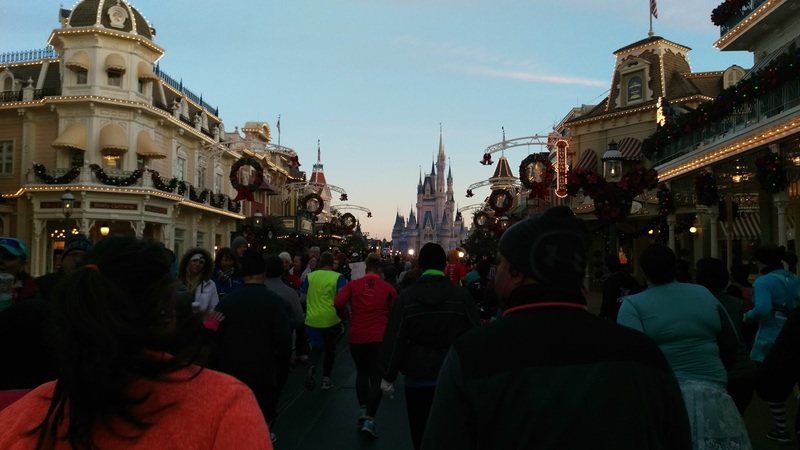 We entered MK and headed straight down Main Street towards the castle. I'll be honest, this moment still gets to me every. single. time. No matter how many times I've run through MK and the castle, it is still special and overwhelming and emotional. My real life Prince Charming. After making a right-hand turn we were headed towards Tomorrowland and the famous Purple Wall! If you don't know what the Purple Wall is, you're not alone- I didn't know until this trip! If you search for the hashtag #purplewall, you'll find thousands of pictures of people posing against this random purple wall in Tomorrowland. 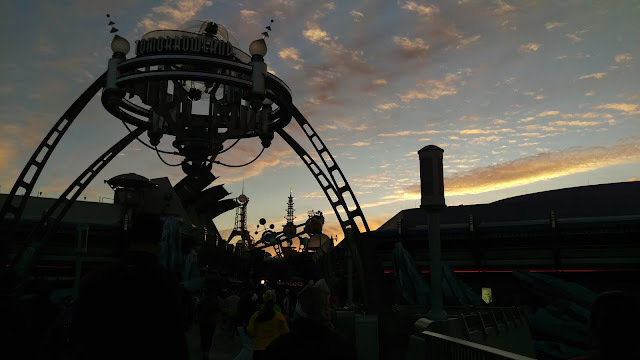 Since we were in Tomorrowland and we had absolutely zero time goals for this race, I grabbed Matthew's hand and we headed to the large purple wall just to the right of the bridge that delivers you to Tomorrowland. Is this what all the kids are doing these days? 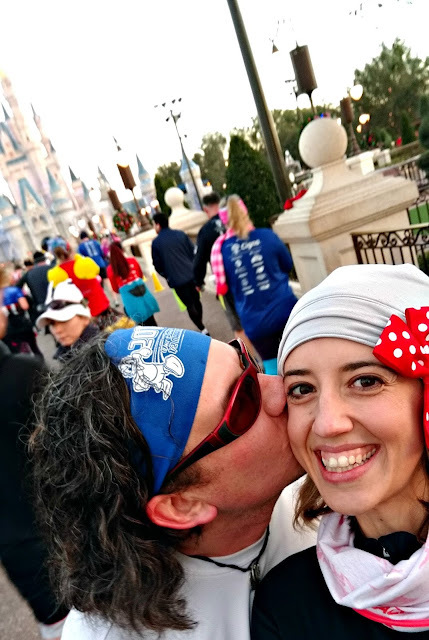 After grabbing an infamous #purplewall selfie, we were surprised again by this course as we traveled all through Fantasyland before running through the castle. 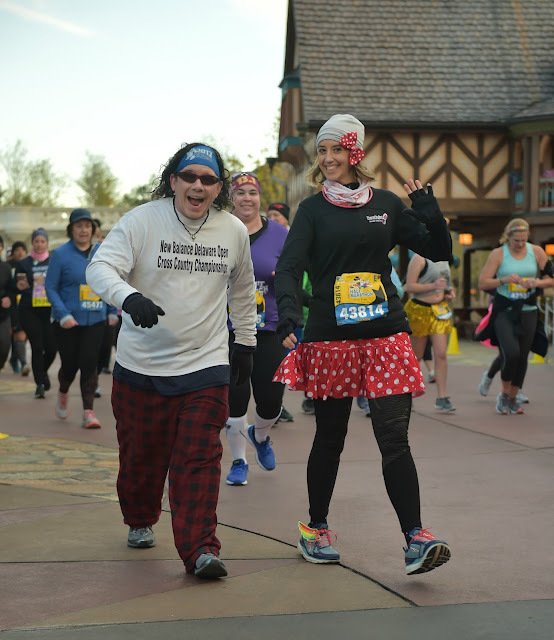 I absolutely LOVED running through more of MK during this race- again, runDisney got this so damn right. Somewhere in the park I finally ditched my flannel shirt- it had served me well. 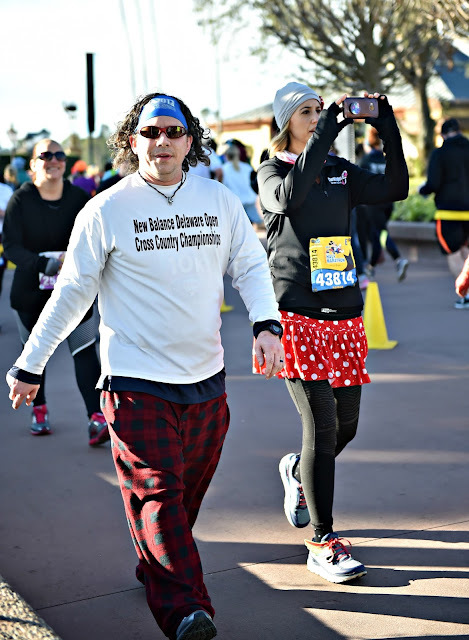 Fun fact- Matthew kept his throw-away fleece pajama pants and long-sleeved shirt on for the whole race! Just strollin through MK on a Saturday morning, ya know? After a quick jaunt through the castle, which was surprisingly not super crowded, we began our trip back to the big golf ball, aka Epcot. 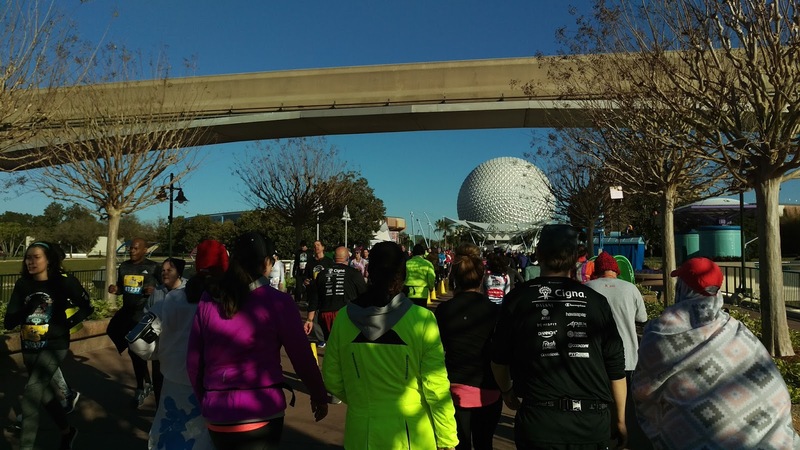 This part of the course can be a bit boring as you're just running along the highways back towards Epcot- I have zero pictures from this part of the course to prove it. But Matthew and I made the best of the uneventful miles with some idle conversation and the miles just ticked on by. Before too long, we were back in Epcot and running the little out and back to the entrance of World Showcase and then out to the parking lot near where we started. Hey golf ball, see you in just a few! We ran through the rest of the park, rounded the corner with the gospel choir, literally ran into our friend Patrick, and then crossed the finish line of my 25th half hand-in-hand with my better half. 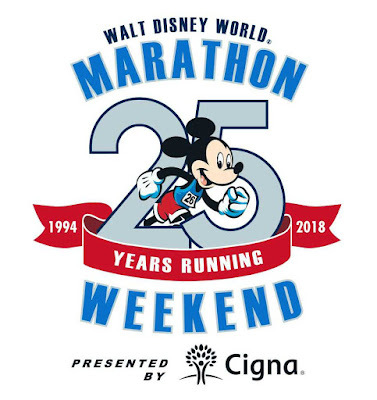 Finishers of the 2018 WDW Half Marathon. Matthew and I collected our runner boxes (filled with snacks!) and grabbed our gear check bags and headed back to French Quarter. We were both pretty tired and cold and were anxious to get off our feet for a bit. That morning, I'd woken up feeling sick again, so I'd taken some cold medicine and had been using a bunch of cough drops on the run. 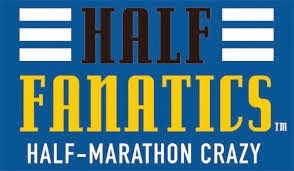 It definitely wasn't my worst half marathon but it didn't feel great either. I could tell I was getting a cold and was getting slightly nervous about the full marathon the next day. 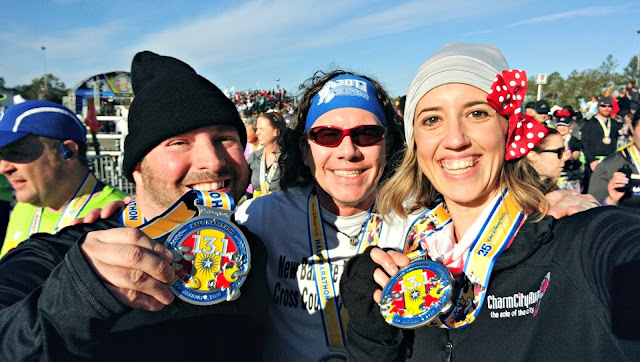 Once we were back in the room, we finally took some finisher pictures with our medals since we'd forgotten to at the finish. That's how you know I'm not feeling 100%- when I neglect to take tons of finsher selfies! We ate like kings, showered, and then napped for a bit before I headed back to Disney Springs for the We Run Social meet-up. We run Disney. Photo courtesy of We Run Social. 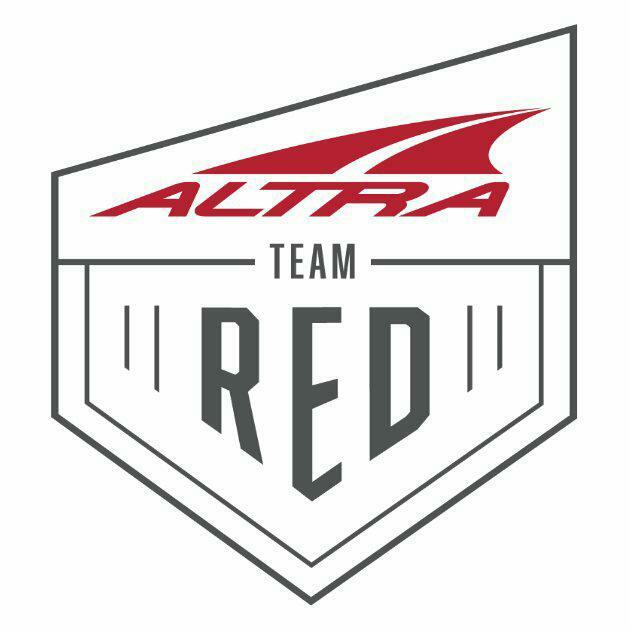 Just like the previous three nights, we got our gear check bags ready for the next morning, laid out our bibs and race outfits, took another dose of cold medicine, set an alarm for 2:30 am, and were in bed by 7 pm. We had 26.2 miles to conquer in the morning- we were going to need every bit of rest we could get! 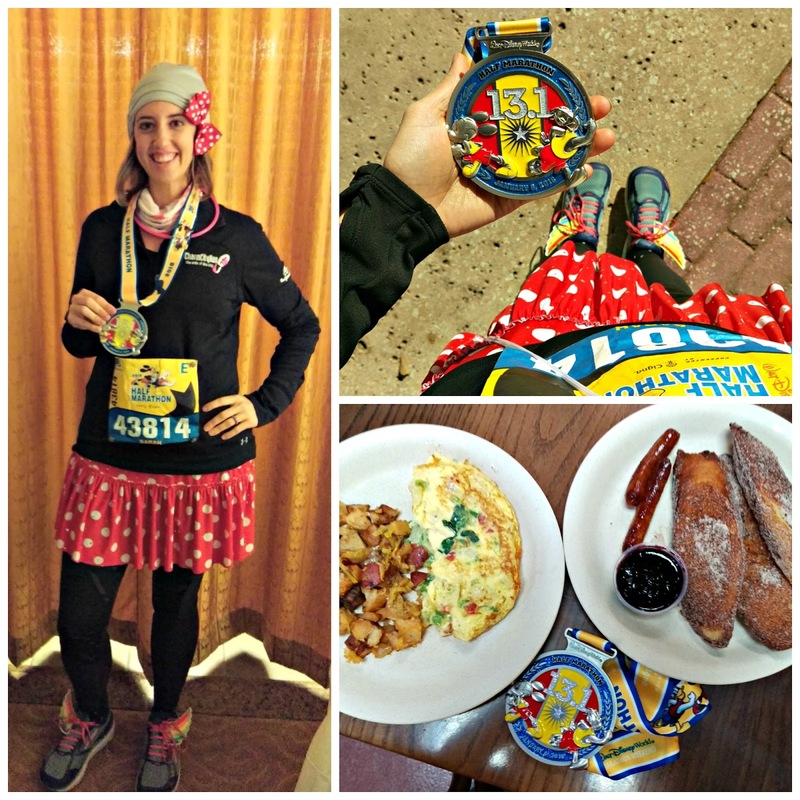 Part one of my unofficial Goofy Challenge was complete; "just" a marathon left to accomplish my goal. When I went to bed Saturday night, I actually felt pretty good. 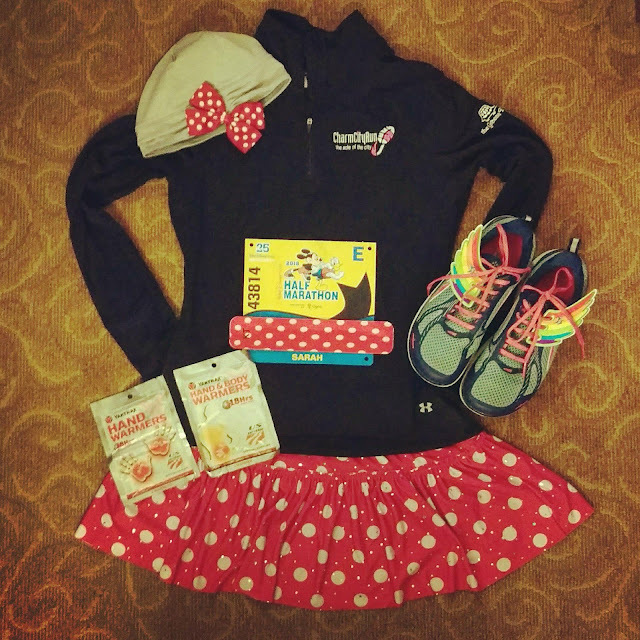 No real aches or pains and besides my cold, physically I felt strong and ready for the marathon. Mentally, well that's another blog post entirely! One more recap to go- the 25th anniversary Walt Disney World Marathon! 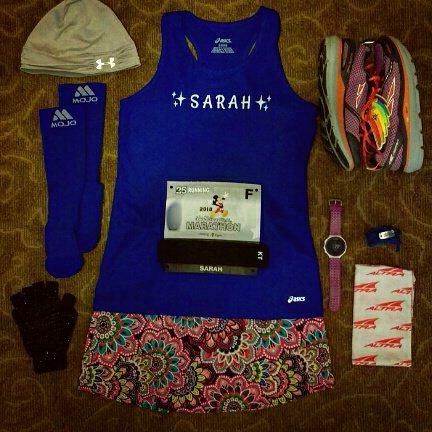 Stay tuned for a story of 26.2 magical- but sometimes challenging- miles! Your recaps are so great to read. Experienced a runDisney event for the first time last year and they are amazing. You do a good job capturing the spirit of them. One of these years I'll make it down for the full marathon in January. Thank you! 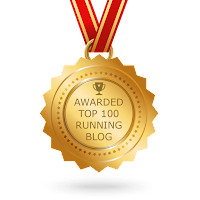 And yes- you should definitely get the full on your list- it's such a great race atmosphere! - The mini waves are annoying when you just barely miss the one before you and have to wait, but I like how much they spread runners out at the start. It feels much more manageable. - The new route into MK through the main entrance was amazing and I really hope it stays. It's so magical. - I'm jealous of some of the photos you were able to get simply because it was light out for you. I can never get a good selfie on Main Street because the lighting is too hard to work with. - I love that you wore a rando's flannel shirt for half the race! - LOL I love them too. - Yup, we totally enjoyed the mini waves even though we might have been hating on them before the weekend. - I was so excited to do it again marathon morning! - I'm always jealous of the folks that get to see the castle lit up in the dark! I loved the new way of coming into the Magic Kingdom...something about going through the main entrance made it extra magical! Yeah, it was absolutely, positively magical! I hope they keep it that way!